Those of you with electric baseboard heat or convectors don’t have to miss out on the smart thermostat fun anymore. The Stelpro Ki STZW402+ (Click to check price on Amazon) is a first. It is the first connected thermostat that works with high voltage heating systems available in North America. 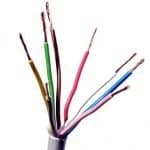 It is also the first product in the KI line of connected products from Stelpro. You may have searched in vain through all the other smart thermostat offerings only to find that none support high voltage systems. It is possible to hook up those other fancy smart thermostats, but it requires some serious electrical knowledge and additional parts. Plus, you will probably need more than one. Most people with high voltage heat have multiple thermostats throughout their house. That means each thermostat would have to be replaced with an expensive smart thermostat. Granted, the Stelpro Ki thermostat is not cheap. But, you can purchase three Stelpro KI’s for the same price as one of those more expensive smart thermostats. 1 How Will The Stelpro Save Me Money? 2 How Will The Stelpro KI Make My Life Easier? 3 What Do I Need To Make The Stelpro A Smart Thermostat? 4 Can I Install The Stelpro KI Myself? 5 Does It Require Batteries? 6 Are There Any Problems? How Will The Stelpro Save Me Money? Electric resistance heating is expensive when compared to other common heating systems. Whenever you can cut down on any heating, the energy savings will add up fast. This means that your new smart thermostat has the potential to pay for itself quickly. The Stelpro KI STZW402+ uses four different levels of heating power to help save you money. Most thermostats just turn the heater on full blast until the thermostat hits its set point. Then, it shuts off until the room cools to where the heat needs to be turned on again. This type of heating causes uneven heating. Your room will end up really hot right next to the heater but still too cold on the other side of the room. Instead of just turning on the heater full blast, the Stelpro turns the heater on in pulses. This will result in a much more even heat and less energy use. How Will The Stelpro KI Make My Life Easier? 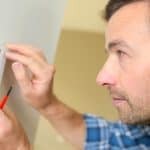 If you have high voltage electric heat, you probably have several wall-mounted thermostats throughout your house. You have a couple options when it comes to your thermostat setting habits. Option A. Set all your thermostats to the temperature you like and forget about it. Option B. Keep your thermostats set to a much cooler “empty” setting. When you use the room, turn the thermostat up to a comfortable temperature and when you exit, turn it back down. Neither of these is a very good solution. Option A uses the maximum amount of energy. Sure, you don’t have to hassle with adjusting the thermostat all the time and you are always comfortable. But you will end up with a higher electricity bill at the end of the month. Option B is inconvenient and uncomfortable. It’s a recipe for cold toes and runny noses. Electric baseboard and convector heaters don’t give you the quick heat like a forced air furnace does. So, when you turn the thermostat up, it will take some time to get back to your desired temperature. If you aren’t prepared with slippers and a cozy blanket, you’ll be wishing you went with option A instead. Even if you don’t mind being a little chilly every now and then, you still have to deal with the hassle of constantly adjusting your thermostat…or, the hassle of forgetting to adjust your thermostat…or, the hassle of thinking about whether you forgot to adjust your thermostat. With the Stelpro, you no longer have to choose between options A and B. Instead you can have the best of both without ever having to manually adjust your thermostat again. What Do I Need To Make The Stelpro A Smart Thermostat? 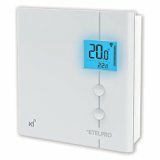 The Stelpro is a Z-Wave or ZigBee enabled thermostat. It is not programmable by itself. In order for it to be smart, it requires a Z-Wave controller such as Samsung SmartThings (available on Amazon). If you want to use your mobile phone to control, you will need to connect your z-wave controller to a router that’s connected to the internet. Your Z-Wave controller can connect and control all your Z-Wave devices including the Stelpro Ki. From within the controller, you can create rules that determine when to raise and lower temperature by switching between “modes.” The Stelpro Ki comes with two predefined modes: Eco mode and Comfort mode. Each mode is just a predefined temperature set point. You can trigger a mode change using the mobile app, certain times, or other Z-Wave products such as door lock, lights, or motion sensors. For example, turn on the living room light and living room heat switches to comfort mode. Or, motion sensors detect home is empty so switch to eco mode. Can I Install The Stelpro KI Myself? Each Stelpro Ki comes with a wall mounting plate and the necessary hardware for installation. If you can use a screwdriver and know how to shut your power off you should be able to handle the installation. You will never have to replace any batteries or worry about losing connection because of a weak battery. The Stelpro Ki is wired directly to the power source so it will never have the problems common with some of the other “power stealing” thermostats. This thermostat will not work if your heater has a fan. Don’t try it because it won’t work and you might even break something. Stelpro is working on a solution that allows the thermostat to work with systems that have fans so I’ll be sure to update the article if and when that happens. Unfortunately, the Stelpro does not currently have the ability to turn off the heat completely. The lowest available setting for the thermostat is 41F. But, Stelpro has said that they are planning on a software update that will allow shutting off the heat completely. This would be convenient for those cabin owners that winterize their cabins so the heat can be completely shut off. The good news is that all the necessary hardware for a nice line voltage smart thermostat is already in place. The necessary upgrades to make this a great line voltage smart thermostat only require software updates. This makes sense too. Stelpro has been around making thermostats and baseboard heaters for awhile. It’s what they’re good at. But, they are new to the smart thermostat market so it shouldn’t be a big surprise that there are a few pieces that are a work in progress. Once your home is equipped with a small army of Stelpro KI STZW402+ thermostats, you will have multi-zone smart control of your home’s heating right at your fingertips. 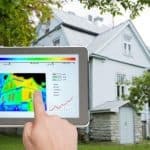 You will no longer have to choose between saving a little money on energy and waking up to a chilly house. If you’re really itching to get in on the smart thermostat craze and you have high voltage heaters, this is not a bad option. And that’s a good thing because it’s pretty much your only option. They are available now on Amazon. Click here for the Z-Wave version and click here for the ZigBee version.